As a gardener I am still reeling from the summer growing season, and while this recent frost didn’t take me entirely unaware, It did make me realize that it is time to wrap it up. And what is left in the garden in nearly November? More than I’d like to acknowledge. If I identify it, then I’m obligated to address it. If I can ignore something, then I don’t have to do anything about it, right? Isn’t that just the way of human nature? Well, I have been ignoring too many things in the garden this fall, and now I have to put up or shut up. Let’s take my hot peppers. (https://eattheseason.com/2013/04/25/garden-planning/) What was I thinking! Who needs that many varieties and plants of pepper? I have singed the tongues and fingers of everyone I know with baggies of peppers and gallons of hot sauce this fall and yet the peppers still proliferate. Thank goodness for the frost. I lost about 3 gallons of hot habinero, Aji and serrano this last weekend and yet I still spent hours jarring what I was able to pick. Well, they are done. All that is left to do is pull out the plants. Not so for every other thing still growing. I have piles of leeks that happen to be very frost hardy. My endive are still clinging to life despite the frigid temps at night and I can’t pull them up until the greens all die back or they won’t force into cornichons properly. My parsnips as well as carrots will happily ride out the cold under their layer of mulch until the ground actually freezes, so I can ignore them for a while longer. What is calling out for my immediate attention are the beet greens. I have a love hate relationship with greens of all kinds. From kale to spinach, collard and mustard, I have grown and eaten them all. I know they are a super food and oh so good for me, and I love the bitter, pungent taste of them well seasoned, but they take so very long to prepare that my shoulders droop at the thought. Washing each leaf, checking for bugs, soaking and washing again…it is so tiresome. I plant them because they are hearty, healthy foods that should be in all our diets, but come fall, when I have no choice but to eat them of throw them out, I sigh and march out to the garden with my clippers. 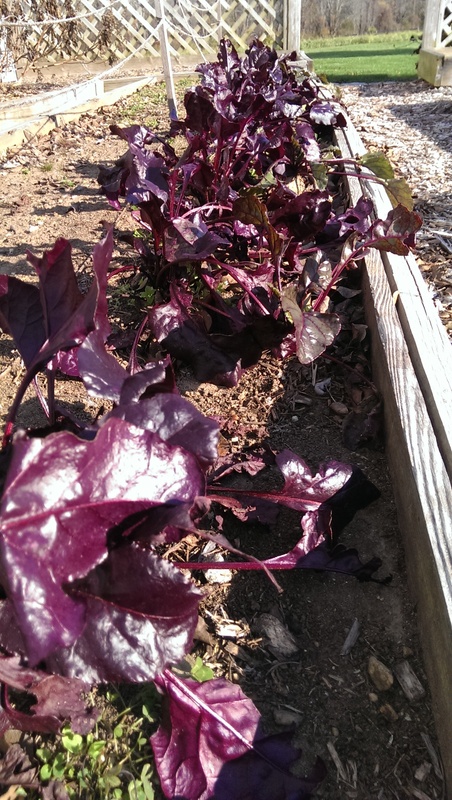 The beet greens I have been able to ignore all summer. In the spring they are too tiny to clip, and I tell myself not to damage the plant until the beet is fully formed. In the summer the greens look like crap, all wilted and hot looking, covered in dust. I’m more interested in the brilliant garnet gems under the greens. Cold borsht, beet salad with chevre, these are the things that grace the summer table. Greens are a fall dish, to be served with venison roast or grilled chops. And now it’s fall, and the greens look bright and lively with the cooler air. There are still plenty of them out there, as I pick only the largest of the beets, and the ones that were planted too deep tend not to erupt. They still have verdant greens but not much of a beet. And so I clip. I came across this recipe for beet green soup that is super simple and interesting. I happened to have some barley so I gave it a try. Perfect for a fall evening served with cheesy bread. Make sure to use a very wide (at least 10″) stockpot for this recipe. That way the eggs stay on the top and don’t sink down in the soup and into oblivion. Beet Green Soup with Barley and Poached Eggs. 6 cups stemmed beet greens chopped to 1 inch. Saute the onion and garlic in the olive oil until soft and fragrant. Add the broth, the beet greens and the barley. bring to a boil and turn down the heat to simmer covered for 30 minutes. Salt and pepper to taste. Crack the eggs and let them poach in the soup until done to desired consistency. (I like a firmer egg so I cooked mine about 6 minutes) Serve and sprinkle with the cheese.